At our last AGM, when the 80 Leaders Doing 80 Walks program was introduced, Neil Schafer announced that he would lead a walk in the program for 80 years and over walkers. This is how The Octogenarian Odyssey came into being. As Neil also invited under eighties walkers, we were not required to produce birth certificates in order to be eligible to join the walk. 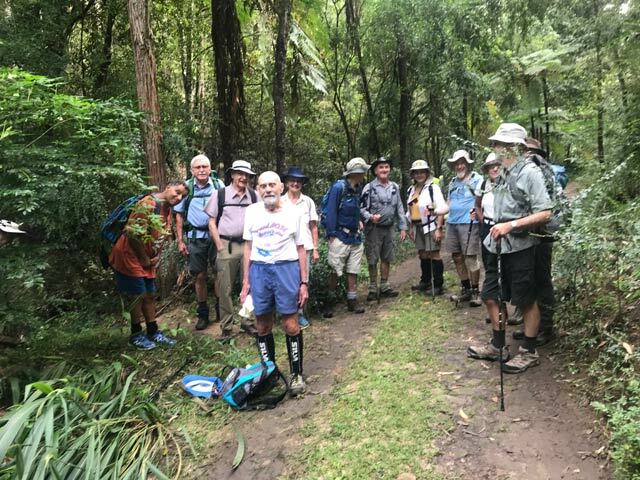 Fourteen walkers, including an estimated five over eighty, gathered at Thornleigh Station and soon we were off down Station St heading for the bush with Neil striding out in front. Despite recent rain the track was fairly dry for most of the walk with just the odd puddle or two and the odd creek crossing. Our first stop was City View Lookout with Barangaroo and the start of Packer’s Folly clearly visible. This was our morning tea spot and the first photo opportunity to record this august event. 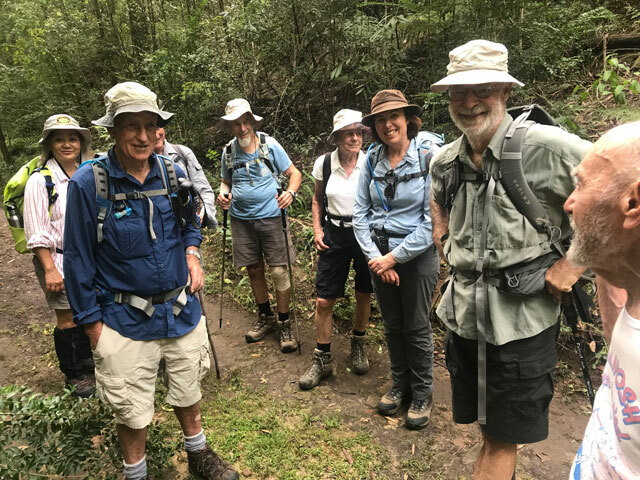 After mornos we back-tracked to a junction that lead us down and over the Lane Cove River to follow the Great North Walk. It was then back over the river and up to the Pennant Hills sports complex where we made use of a line of benches for our lunch spot. 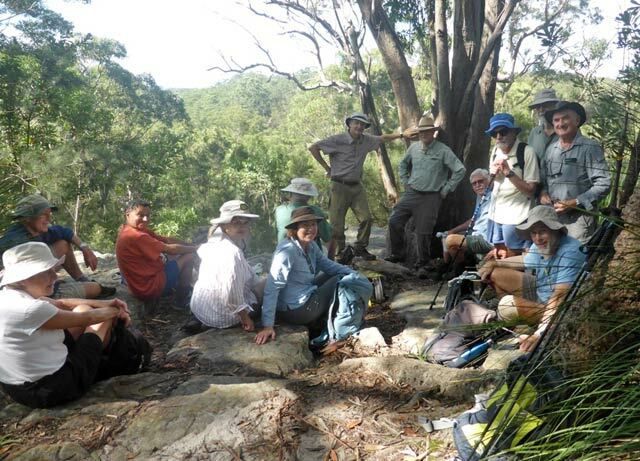 After an earlyish lunch Ken and Steve said goodbye and for the rest it was back into the bush with the track gently descending to cross Byles Creek before skirting Ahimsa on its way down to and across Devlins Creek just below Duckys Waterholes. We then followed Devlins to where it runs under the M2 with the track then ending in the streets of Epping with about a kilometre along Derby and Oxford Streets to Epping Station. Some opted out but most did a small tour of the coffee shops before settling on one opposite the station for a last chat around the table before heading off in various directions after a most pleasant day in Neil’s good company.